Comber man Gary Hunter came face-to-face with the reality of death 10 years ago when he was diagnosed with the incurable blood cancer Chronic Lymphocytic Leukaemia. Forced to take medical retirement from his job as a journalist in 2011, he was left struggling financially and emotionally. Here, in a frank interview, the married father-of-three talks about how he has dealt with facing his own death. “It was a pretty bad time for a while. Eventually as you do with these things I accepted it. You experience all the gamut of emotions they tell you about: Anger, disbelief. For a while you feel like the earth crumbled beneath your feet. It’s a strange sensation, there’s almost a moment of – I don’t want to make it sound trite – almost a giddy acceptance; you are almost on a high about it.... it’s almost like ‘okay the worst has happened’. When a man knows he is going to be executed it concentrates the mind wonderfully because all of a sudden you have to confront your mortality in a very real stark way. And of course it’s not only yourself, you are aware you are going to have to set your kids down and tell them, you are going to have to tell your wife and family. My three kids were all still at school at the time. When we told them they were upset but Sarah, the eldest child, and James were quite alright with it and quite accepting. They coped with it in their own way. Jonny, my youngest took it quite badly and became quite withdrawn. He was following me about the house, asking ‘do you want a cup of tea Dad’ ‘is there anything you want me to get’? I just wanted him to go out and be a child and play football with his mates. I suppose in a way it was reinforcing the fact that I was ill. They are quite strong characters, they did cope with it and there was counselling available from the charities if they needed it. I think the way I dealt with it made it a lot easier because I tend to be upbeat, positive about it and quite rude. A big dose of black humour in the way I confront it. I think that helped the kids because I would laugh a lot of the time and you know there were moments of great humour. Jonny would have said to me when I was facing the chemo ‘what are you worried about Dad, sure you are bald anyway’? I threatened to come down to school on my mobility scooter and slippers and he would say ‘Dad, Dad please don’t’. You might as well use the cancer for something – to embarrass your kids. There was a myriad of things to consider – an awful lot of darkness and uncertainty. I was working at the time; I was thinking about what am I going to do in work? Will I tell them? Am I going to be able to work? What’s going to happen? All these considerations bombard your mind. In the early hours of the morning you are thrown back upon your own thoughts and your own fears for what is in store, for what the future holds – even in terms of surgery, chemo – how is it going to impact your life? There certainly are impacts; there are many, many impacts - in no way are you prepared for – so there’s a lot to take in. It’s an ongoing process. Things can change. I get regular letters, the dreaded brown envelopes syndrome inviting me for scans or reviews; so it’s like we are never allowed to forget about it. It’s always there, it’s always hovering. It’s a constant presence standing behind you, tapping you on the shoulder that it hasn’t gone away. I don’t fear death. I am not being brave. I am just stating how it is. I long ago lost my fear of it. If I hadn’t done so I think it would have come for me a long time ago. I think the fact that I don’t have a particular fear of death helps me to keep living. The more proactive you are; the less power it can exert over you and you learn to live with it. I try to write as much as possible and almost fight my way through it – that is important to me, not to give up. I get a lot of comfort out of my writing. I recently graduated with a Masters in Creative Writing at Queen’s University. I got a lot of joy out of that." "I suppose a lot of people do fear what they see as oblivion, the end of everything. But for me it’s how you live, how you live in the here and now and that’s what matters. I don’t like to sound philosophical but I think that is the best way to approach it. There has to be an acceptance and with acceptance there can almost be a sense of serenity about it. You realise that today you are alive and there’s a peace and comfort in that for me. In many ways when you are confronted with death it makes the reality of life even more precious. You are more aware of your time, you are more aware of the beauty. Everything is a lot more vivid. 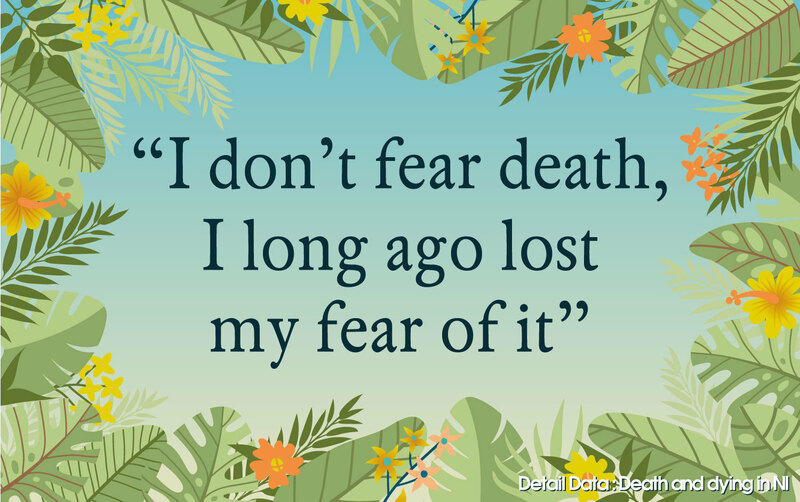 Death is a part of life so it is important to think about it and to consider how it will impact on your family. The more you think about it, the more you have things in place for such an eventuality. This may appear quite ghoulish or maybe very noble but I have donated my body to the medical biology centre at Queen’s University for research purposes. How that works is when I die someone will come out for me and take me to the medical biology centre where I will hopefully further the cause of science and be of some use. That’s my plan anyway. The family are all across that and the paperwork is in the right place along with my will. I also think on a selfish level it takes a lot of grief away from the family so they don’t have to organise anything, it’s all done for them. We all live on through our kids. I have told them if they have dreams, if they have ambitions to go for it and not be put off by what anyone tells them because live is too short; we all need our dreams and we need something to strive for. If they’re happy in whatever it is they do that’s a good enough legacy for me. I don’t want to sound clichéd about it but there is a certain reassurance in realising that for most of us today is all we have and there’s almost a certain peace comes with that knowing. Living in the present is very, very important." Gary is being supported by Marie Curie.